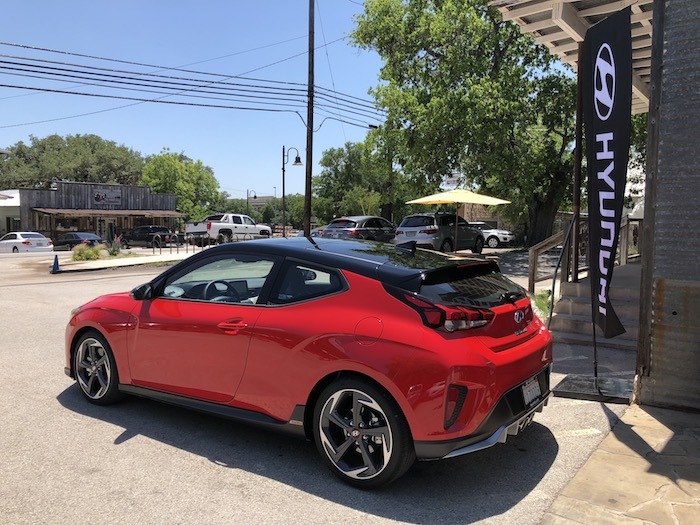 Welcome to Austin for the press launch and test drive of the all-new Hyundai Veloster compact sports car and hot hatch. 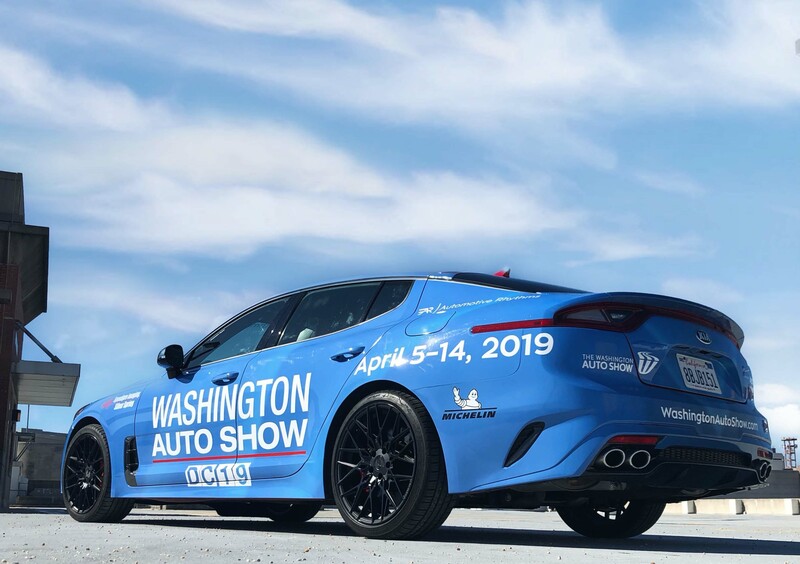 It was a beautiful and heat filled day in the Texas Capitol as we zipped around town in 2019 models enhanced with sticky Michelin tires to mirror the unexpected small car excitement behind the wheel. 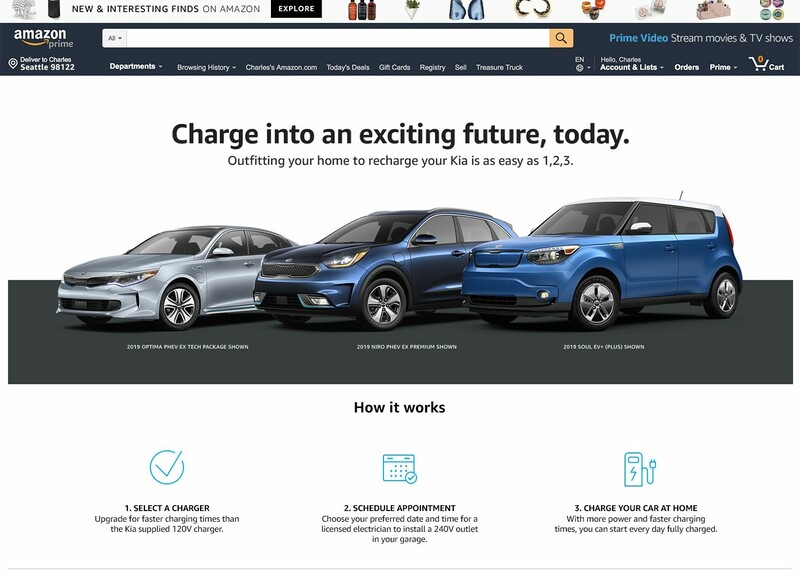 Now in the 2nd generation, the three-door, Korean performance vehicle is an industry anomaly and will certainly continue attracting young, urban dwellers towards its ingenuity. 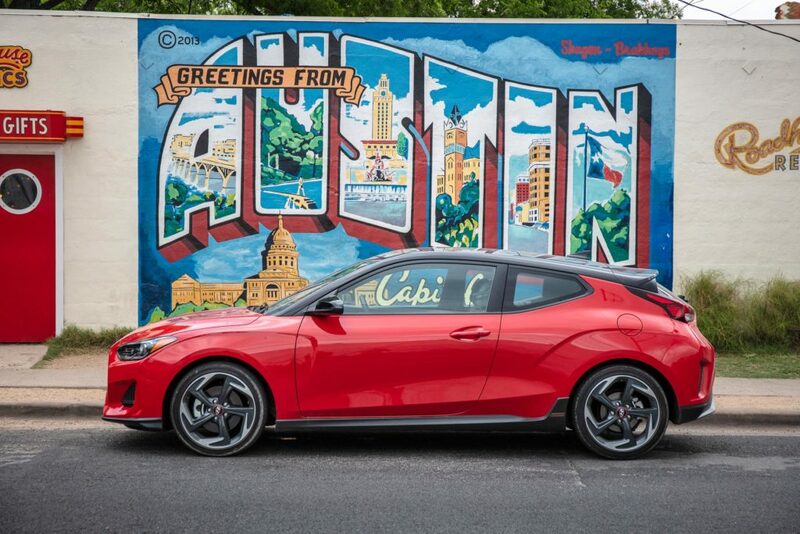 When the Veloster, quirky in both name and styling, first hit the scene the marketing objective was to draw a new audience into the brand which the Korean automaker certainly did. These neophytes produced more income than the traditional Hyundai customer, half had never thought of owning a Hyundai before and 70% were jumping ship from other brands such as Honda. 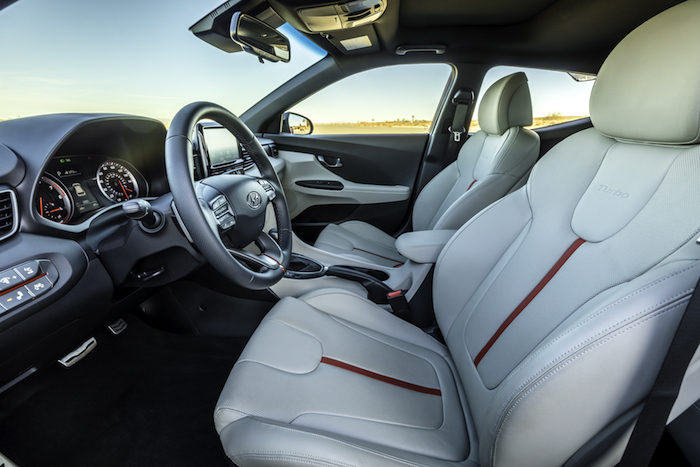 I recall back then hosting test drives of the Veloster in Las Vegas with UNLV students and many were taken aback by the two-door passenger side and single-door driver side design but the imagery was uniquely attractive to their mindsets. Today Hyundai is focusing on “expressive curators who are generally single, live in the city and range in age from 26 to 34 years old. I will say I’m not a match at 44 with two kids and a wife but the Veloster is appealing to me. What is obvious between the first and second generation is the fitness training the Veloster undertook. Physically, the profile is squatted, the body is cut like muscle heads and the hatchback moves like rabbits dashing from foxes. It’s about the same size as its predecessor except for a slight exaggeration in length and width. Hyundai executives said they increased rear headroom a bit but my bald scalp kept crazing the ceiling and I’m 6” tall. 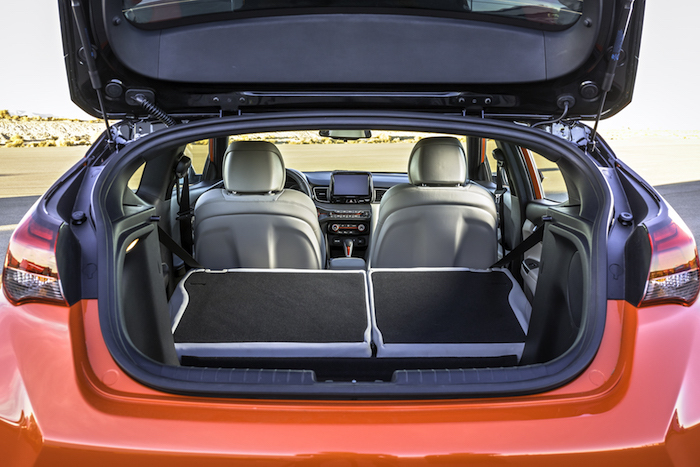 But, owners are provided with almost 20 cubic feet of storage behind the 2nd row which looks to be best-in-class. To go along with the Veloster’s updated physique, notable enhancements include available LED headlights and taillights, optional 18” alloy wheels (three to choose from) including the Ninja throwing star designed rims, aggressive fenders and wheel arches, dual center exhaust tips, functional air curtains, wide sunroof, integrated tailgate spoiler, massive grille and the sporty chin spoiler. Visually the vehicle is fierce and dynamic. On the zippy, rural roads outside of Austin I played with both the fully-loaded Veloster Turbo Ultimate and the Veloster Turbo R-Spec. 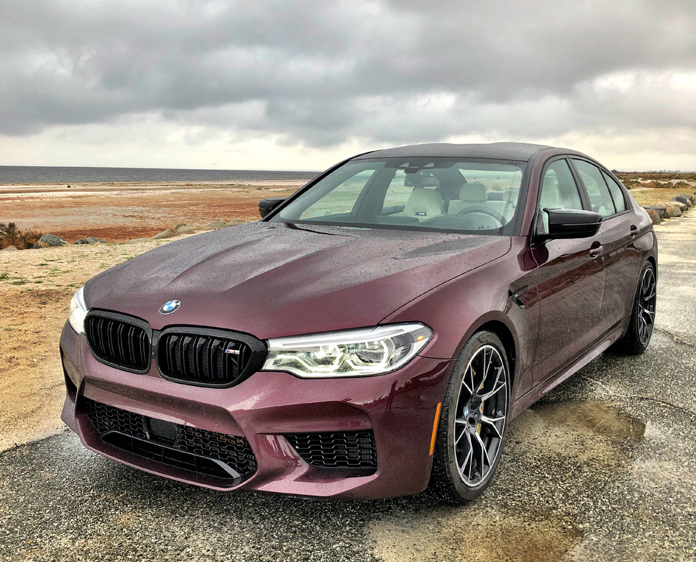 For $29,160 the Turbo Ultimate receives the 1.6-liter Turbo GDI engine with 201-horsepower and 195 lb.-ft. of torque starting at 1,500 rpm, a paddle shifting 7-speed dual clutch transmission with Drive Mode Select (DMS), 18” alloys wrapped in Michelin Pilot Sport 225/40 R18 summer performance tires, a black two-toned roof and an Infinity premium audio system with 8-speakers, a rear subwoofer and Clari-Fi audio restoration technology from Harman, all of which made the rhythm from our reggae sets proper. 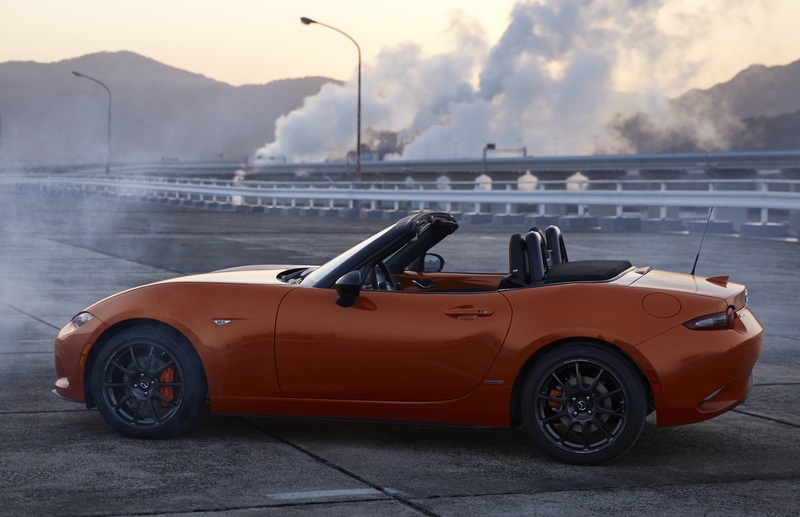 Steering is firm, the wheel feels good and downshifting while accelerating using the shifters is thrilling, especially in Sport mode which is official. 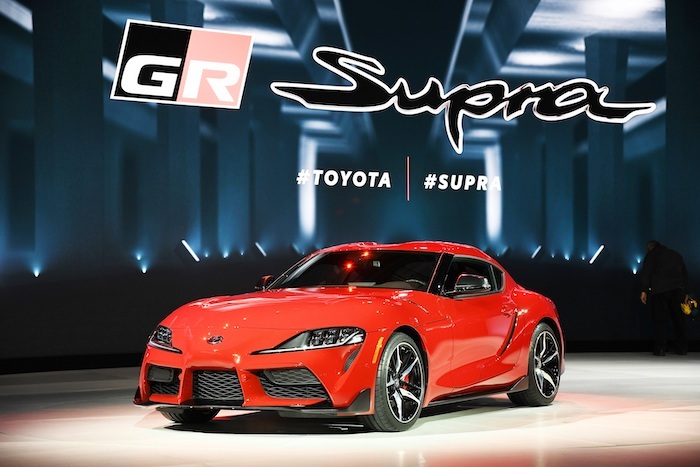 The Ultimate was also blessed with Torque Vectoring Control which provides side to side traction when needed. Some notable safety and driver assistance packages that will keep the little guy as protective as possible are ESC, Brake Assist, Blind Spot Collision Warning, Forward Collision-Avoidance Assist with Pedestrian Detection, Lane Keep Assist & Driver Attention Warning, High Beam Assist, Rearview Camera, Driver’s Blind Spot Mirror and Smart Cruise Control which I had no need for since I wanted full control of the Veloster. It’s just too fun! The 2019 Veloster Turbo R-Spec I rocked came in Thunder Gray with vibrant yellow accents and lines throughout the dark cockpit. 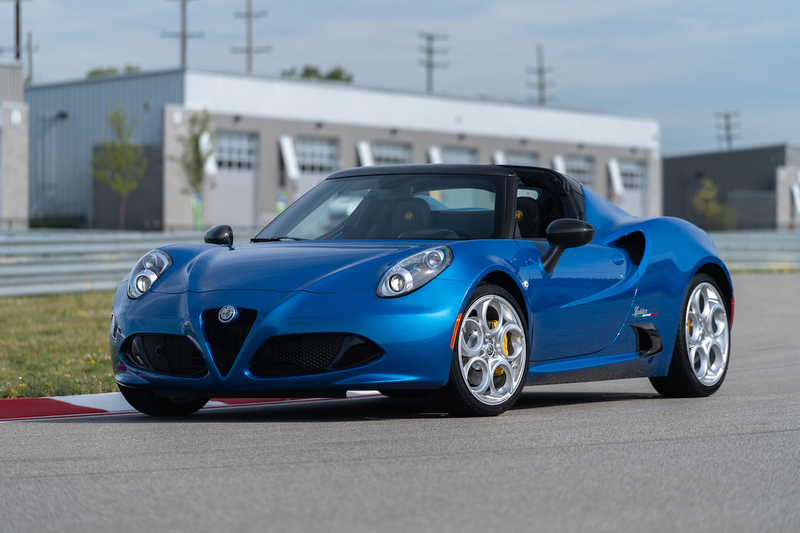 It utilizes the 1.6-liter turbo engine as well but was paired with the 6-speed manual transmission and its B&M Racing shifter which I was not a fan of. The shift gate was like a maze trying to figure out the gearing positions. My R-spec also came with alloy pedals, Hillstart Assist Control and a sport tuned suspension, steering and exhaust. Speaking of mazes, the stiffer suspension certainly helps the Veloster navigate winding roads with agility and aplomb. This model paired the turbo with DMS which alters throttle, steering and shift logic for example. 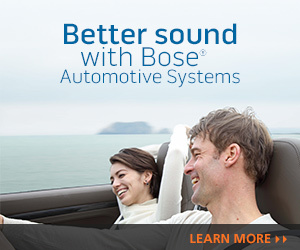 Active Engine Sound similarly comes with the turbo models and is tied to DMS and can be optimized or shut off completely. Though, I toggled through the settings and couldn’t really hear a specific difference. 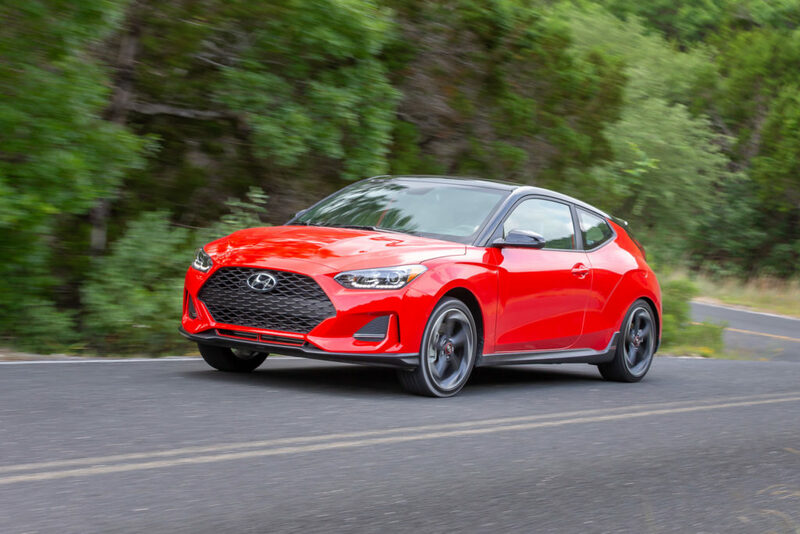 The other engine choice is the base 2-liter with 147-horsepower, and the three remaining trims include the Veloster 2.0, Veloster 2.0 Premium and Veloster Turbo. 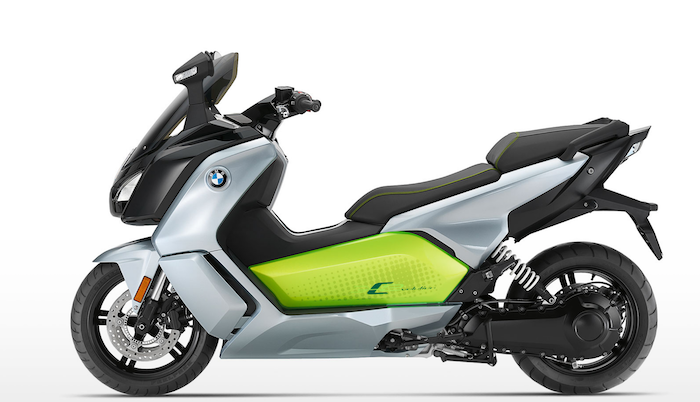 Pricing starts at $18,500. Inside the cabin is a plethora of communication and infotainment technology starting with the stationary 8” navigation system, 8” Heads-Up Display, Apple CarPlay, push button starter, Blue Link Connected Services, Blue Link Remote Start and available Alexa integration. The Turbo Cloth seating is also my preference opposed to the leather materials. In the rear knee room is limited so don’t expect to put two of your football buddies back there! All-in-all the Veloster experiment is a successful one and is achieving Hyundai’s objectives. It looks good in an Austin weird way and rides exceptionally fantastic. Plus, you can still roll up to Home Dept and Target to load up the back with household goodies!